and State Fair, and this summer, essayed for the very first time the role of Miss Hannigan in Annie. She is about to repeat Miss Hannigan for Musical Theatre West's production opening in Long Beach on October 30. 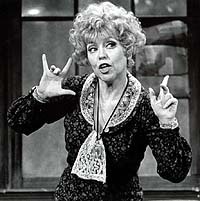 In our chat she speaks about Annie, Hannigan and other theatrical delights. Was 1977 - Annie - as stressful as it was successful for you? When you're a kid, it can't be easy. How did you handle it? What do you think now as you look back? I think the beauty of the whole experience was we really didn't know what the stakes were. So, there was no stress. The whole idea of acting is getting back to the mind of a child, so it's a lot easier for kids and, if there's a right type like I was, incredibly ADD-ish (Attention Deficit Disorder) who needed to be consumed at all times - I'd have to draw while I was listening to the teacher, be active - so that's what grabbed me so much about theatre. I actually started in television. 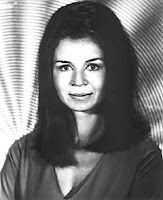 I did about 50 commercials and then I played Louise Lasser's daughter on a CBS pilot that Alan Alda presented, and then - of course, it was the one right before Mary Hartman - and then I did a soap for three years, so I had no theatre experience. The minute I had it, it was a great one. 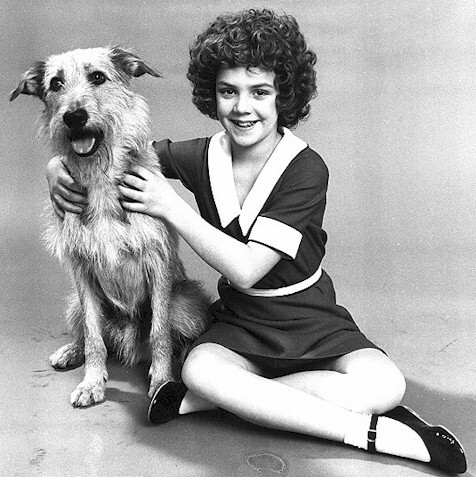 Talk about your first experience in theatre at all was that show and that role (Annie). You must have been singing from an early age? You had (and still do have) a terrific voice. Thank you. Since I was about seven or eight. As a teenager I loved the whole aspect of singing and dancing. Singing was easy for me to do, not that I was particularly good, but my parents were music freaks. They always had incredible music around in my house. I loved music before I loved TV. Well, you knocked those songs out of the ballpark eight times a week and that couldn't have been so easy? No microphones, no body mic. That was an incredible task, but I think most people don't understand the art of true, natural theatre projection. It's almost a hindrance now, as they write songs so loud. My dream is to have something that goes back to a more natural acoustic sound. Now we're so used to hearing this pumped up and beefed-up and wet sounds on Broadway. Natural works just fine, I think. Is you solo CD Andrea McArdle on Broadway from the 90s your only one? It's just great! For this next year that's my big task. I want to do a real live one, not the studio kind. A pure live concert ...maybe in LA. Full band...I want to go broke doing it. The first one was produced by my husband (composer Ed Kalehoff) and it was clean, maybe a little bit too pop-ish an approach to some classics of roles that I played. I'm a studio girl; I love singing in the studio. I also love doing cabaret and concerts, so I still prefer singing live. What is the favorite role you've played in a show? I have to say probably Sally Bowles in Cabaret in 2001. I was 37 at the time, and it was right after I had done Belle (Beauty and the Beast), so it was quite a switch. Then I got to do it three times again in Tokyo. For somebody who's played good girls all her life, it's so much fun to play a bad girl. 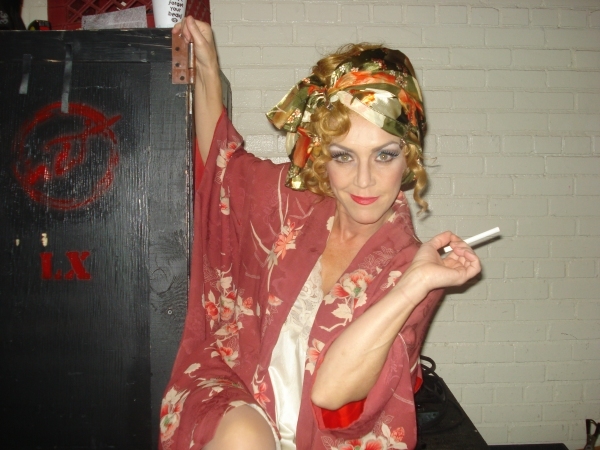 Speaking of bad girls, how did playing Miss Hannigan this summer work for you? It went great, but I have to tell you, it was a strange thing. You know, I had made my peace with the show. It's a part of my legacy, which at times has been a thorn in my side, but it's opened many more doors than it's shut. Those that know me know that there's a whole lot more to know, especially these after 40 years. Did you want to do the role? I've wanted to do characters for about ten years now. For instance, I've wanted to do Madame T (Thenardier) in Les Mis, but not yet. I've done Eponine and Fantine. Ever since I was a little kid and saw Angela Lansbury in Gypsy, I never wanted to be anyone in that show but Mama Rose, but I was cast as Louise and my father would not let me go on tour. I'm a huge Angela fan and that's a role I dream of. Angela, Elaine Stritch, Chita, all those old schoolers. Have they approached you about doing Miss Hannigan in the newest Broadway incarnation? No, they haven't. And it would be a really great thing if I turn out to be great in the role, and if I'm not, I have no interest in doing it. It's really fun for me to be able to do a few regional productions with some really solid theatre companies with fresh eyes and fresh vision. It's been a departure of sorts and I'm excited about getting to Long Beach and to apply all the things that occurred to me in North Carolina and all those epiphanies that I had...you know we had a really short run this summer. Usually I'm a very quick study - and I know the show. It was so hard for me not be outside my body watching the whole thing like somebody on The John Edwards Show. It was bizarre. It was a trip...I had to focus, meditate and do all sorts of stuff. Usually I can just walk right in there, but this was very tough. I hope I got that all out of my system, because I did have those weird, freak-out moments when I said, "What are you doing?" How much of Dorothy Loudon (the original Miss Hannigan) is there in your portrayal? Did she have a great influence on you? Are you kidding? Huge. I mean, huge... we were sitting there at the Kennedy Center playing carpet jacks - jacks on the carpet, because they got sick of hearing us - we're sitting behind the sofa and "Easy Street" wasn't really written until right before we opened. To sit there and see her working and doing that improv thing with Tommy Meehan and Martin Charnin, who were very sought after writers at that point - they were actually picked for SNL (Saturday Night Live), the initial writers... Annie was the same year. She...she hung the moon for me. She didn't really like kids, but I'll tell you, we had such a great relationship, 'cause I had that real little "You can't take the Philly out of the girl" and she loved it. I told it like it was and she was the same. We had this kind of sistership. She was amazing. She'd look at me and she'd say, "One more Goddamn time...", as I was saying something funny, "...and you don't have to come back to the Alvin Theatre ever again. We're going to change the locks." She could talk to me that way and she was great...she was brilliant. The two of you were so great in the original show... Who are your favorite singers? Most of them are really old like R&B and gospel singers. I love Billy Joel, Stevie Wonder. I usually like male singers more, but I'm a huge Rosemary Clooney fan, Shirley Bassey fan, Dionne Warwick, Karen Carpenter definitely... and new people like Pink, I love Lady Gaga, John Couger Mellancamp, Ricky Lee Jones...I like funky weird; I have eclectic tastes you know...but I'm a sucker for good R&B. Who is your favorite composer for the Broadway stage? I would have to say Sondheim. I love R and H music too (Rodgers and Hammerstein) and Kander and Ebb. What about your favorite shows? Gypsy, West Side Story and Sweeney Todd. My modern favorite would have to be Les Miserables. The cinematic beauty of it...and it was also the show that my daughter (Alexis Kalehoff) made her Broadway debut in. That was 1996, and she was there for quite a while. Is there a role you yearn to play? I'd love to do Next to Normal and I'd love to do Mrs. Lovett (Sweeney). I've always wanted to do Chess...oh and Norma Desmond in Sunset (Boulevard)... even in the next five years... yeah! I lost her as she crossed the Triboro Bridge. Driving and talking on a cell? Illegal... but everybody does it! Oh, the modern age, cell phones and the courage/lack of shame of some actors! Maybe she was hypnotized by the spirit of Norma Desmond, who knows? There one minute, gone the next! 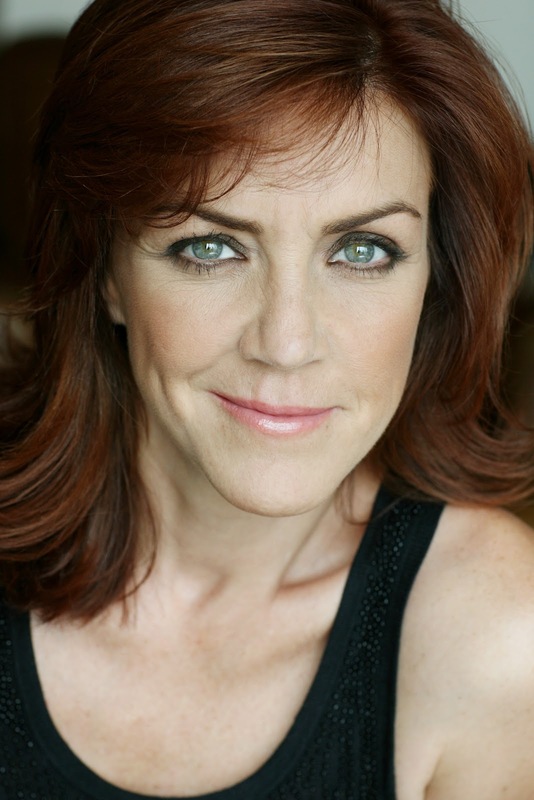 She'd make a great Norma, but, at present, you must see the amazing Andrea McArdle as she comes full circle in Annie as Miss Hannigan in MTW's new production, previewing October 29, opening October 30 and running until November 14 at The Carpenter Performing Arts Center in Long Beach. 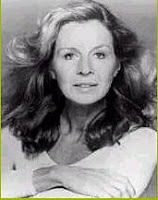 Actress Stephanie Zimbalist certainly needs no introduction. 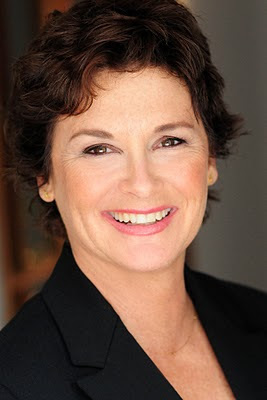 With her star turn on Remington Steele on TV in the 80s, her multiple MOWs and frequent stage appearances all over the country, she is an actor in demand. In this conversation she talks about the challenges of playing Katharine Hepburn in Matthew Lombardo's Tea at Five, which she recently completed for the Rubicon in Ventura and is about to open at the Falcon Theatre in Burbank on October 22. Just how difficult and challenging is it to play Katharine Hepburn? How does one prepare for this? A lot of luck! Reading her autobiography and combing through it for what’s between its lines was very helpful. I started the first rehearsal four years ago already basically off-book. I think frankly that was a great suggestion on both John Tillinger’s and Matthew Lombardo’s parts, for that first Ordway production I did. Had someone suggested the part to you or did you yourself feel you were right for it? Daryl Roth, one of the original NYC producers of TEA – who cut her producing teeth with Linda Purl and me on THE BABY DANCE, by the way – asked me to do Wednesday matinees for that first NYC Promenade production of TEA with Kate Mulgrew , back in….2005, was it? I declined, too much work for too little payoff. Then Matthew Lombardo himself was producing a production at the Ordway in St. Paul, MN in 2006 and asked me to do it, on his director John Tillinger’s “nudge.” Thank you, Joey. P.S. There was a scheduling snafu, Tillinger was in Italy, so Chris Catti the fab stage manager put me into the show at our MTC rehearsal space, and I basically directed myself the first time I did it! What a trip THAT was! I left out six pages in the first act one night, and the playwright, in the audience that night, didn’t even notice! If the play has a purpose - like Hepburn writing a memoir or giving an interview - what do you think it is? She has always been so private! I think what the audience walks away with is that marvelous dichotomy of the young, The Screen Icon morphing before your eyes into The Triumphant Old Lady Survivor – just like US. Your association with Jenny Sullivan and with the Rubicon in Ventura has always been wonderful. Talk a little about that. Thank you, Jenny, thank you Karyl Lynn and Jim! For TEN times at bat at the Rubicon. Wonderful place to work, actor-oriented, Ventura is charming, easy, COOL, and lovely, and close to home. Jenny and I go way back to Jane Anderson’s The Baby Dance, KLB and Jim saw it and first hired Jenny and Linda Purl for their inaugural Little Foxes production (I heard every detail from Minneapolis where I was having a GREAT time tackling ‘Terry’ in Side Man at the Guthrie). Then they asked me to play ‘Lizzie’ in The Rainmaker (with fellow Baby Dancer, the great John Bennett Perry), which we reprised the next season. Another Hepburn role. After I met KH (she ran up the backstage stairs of the Lortel in NYC to congratulate all of us Baby Dancers in 1991), I played Tracy Lord in The Philadelphia Story for Sheldon Epps at the Cleveland PlayHouse – another Hepburn role. I haven’t seen a lot of her movies, but I have many to look forward to! My favorite so far, acting-wise, is her ‘Mary Tyrone’ in A Long Day’s Journey Into Night. What about roles you've played? Do you have a favorite? Why ? Loved playing Sylvia, close to my dog-like heart. I’d do it again, if asked, at the right venue. A.R. Gurney’s beloved play About The Dog. You were terrific in Sylvia. Is there a role you really want to tackle? Would love to do The Rose Tattoo amd Margulies' The Loman Family Picnic, among others. Maybe you should consider bringing back Coco, now that you've done Tea at Five. You are a terrific singer and could do your own thing with that. Any desires to do a musical? Love musicals, never saw Coco, but if KH says it sucked, so be it, she's probably right. So you are happy at present with Tea at Five? This might be the best thing I’ve done to date, and this is my fifth time at bat with it, a really solid text that is a real crowd-pleaser, a beautiful set and delicious lighting, great music, lovely costumes if I can lose that last 10 pounds, and Jenny Sullivan’s wonderful touch at the helm. I’d say, all a bargain for the cost of the ticket! 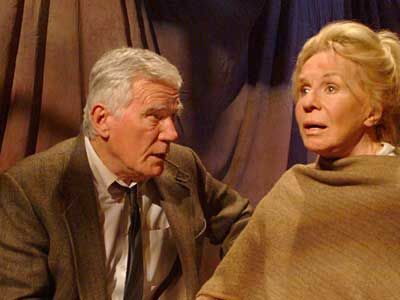 Actress Salome Jens is an actor's actor. She considers acting a pure art form and is ever respectful of every single role she plays. From films like Angel Baby to Mae Olinski in TV's Mary Hartman Mary Hartman to her one-woman play About Anne, her work is passionate, thoughtful and evocative. 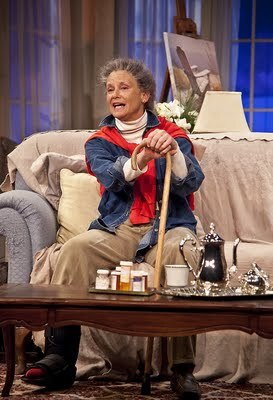 She will be performing About Anne @ Group rep in NoHo November 19 and 20 as a benefit for the theatre. In our chat recently conducted on the stage of Group rep, she talks about the roots of About Anne (poet Anne Sexton, who struggled her entire short life with mental illness and committed suicide) and other theatrical passions. How did this project first evolve? How therapeutic for so many people! ...It just took off, and people loved it. Am I correct... I believe I read that it was a therapist that recommended that she write poetry? Yes, but not poetry. He said, "Write! You need to write." And the interesting thing is she had a mother who was very jealous of her or least she thought she was. She stopped writing when she was a young girl and was very resentful of the mother. Obviously, they were very competitive. She left home at 18 and eloped with a wool salesman. There was a lot of pain, and she was obviously a rebel, a wonderful rebel. After the birth of her first baby, she had a breakdown. Then the psychiatrist recommended that she write. At that point in her thirties until the time she died, everything she wrote was published. Everything. And she was a Pulitzer Prize winning poet! It is astonishing that in such a short time, and being a woman on top of it, that it could have happened. She was certainly a friend of Sylvia Plath, and she studied at Harvard with Robert Lowell. So she really grabbed on and went to wonderful people to learn. How often have you done this play? After that initial 6 week run at the McCadden Place Theatre in 1985 ... my brother-in-law, Anthony Zerbe and Roscoe Lee Browne had a company called Poetry in Motion. Anthony started to book me into universities, women's clubs, places like that. I still do that. Do you think that this is the best part you have ever played? ...we were the first actors who did it off-Broadway at Circle In the Square...a major O'Neill play. Then they did it on Broadway, after we had done it. What a shame that you didn't get a chance to do it on Broadway! Exactly, I really feel sad about that. It was a piece we certainly felt very powerfully about. And I've done many other roles... Cleopatra, Martha in Who's Afraid of Virginia Woolf? I also did a benefit of that for the Actors Studio. It's a hard play, but, boy, is it fun to do! Oh yes. I work with the MFAs at UCLA. I will do the winter quarter now. I also have my private classes... I've been teaching for about 30 years. You obviously love doing it ...and the word around town is that everybody loves you. Well...I call myself not an acting teacher but an actress who teaches. It's not my profession. I would never make my living off of teaching. I can't ask the actors to pay. I'm very reasonable. I don't teach for profit. Coming from the Actors Studio and working with Strasberg...he was my teacher for over 25 years...I got it for free...that's where I met Lonny (Chapman)...having had the privilege of working with these geniuses...Harold Clurman, Stella Adler...but Lee was my mainstay, to have the Studio there, to grow in, for free, with all these wonderful people...I mean, amazing to see all the peer group working, that they had the same problems that I had, and I was learning, learning, learning...and the wonderful thing about Lee was, he was evolving too. We grow; we never stop growing. I still do a lot of moderating at the Studio. It made a home for all of us. Let's switch to Star Trek and Deep Space Nine! Did you have fun with that? It was fine. It was rather a Godsend in a way. I had no idea when I was doing it what it would turn into. It's amazing, because that character (Female Shapeshifter)...everybody thinks she's so evil...I love the character, "Why do you think she's evil?" She was looking at everyone saying, "You're crazy fighting. Where I come from there's no fighting. You can be anything you want. What are you doing?" The cast was wonderful; the stories were interesting. Like a Greek tragedy, there's something quite wonderful that happened with all of them. And the mythology around it now is just so lovely. I went to one of the Star Trek Conventions last summer, and there were 5,000 people there. All of them so dedicated and sweet...from all over the world. I get fan mail from Japan, Germany, all over the place. It's amazing! What other film work have you enjoyed? I loved working with John Frankenheimer on Seconds. That was with Rock (Hudson), an absolutely wonderful film. I certainly loved doing Mary Hartman, Mary Hartman. I'm glad you said that. That's one of my favorites. I still have an image of you in my mind lying on a bed wearing Tom's baseball cap and smoking after your supposed tryst with him...hilarious! It was a wonderful group of actors, and we'd get the script the night before and shoot it the next day. You had to be up, to act on your feet! I studied with him. What a lovely man and great teacher! Genet's The Balcony. That was the big thing in my life. It was one of the first plays that put me on the map. Jose had seen me do the Ionesco plays at the Sullivan Street Theatre (New York). I'm walking down the street one day, and he comes up to me...and I didn't know him yet, I just knew that he did Iceman (Cometh). He said, "I'd like you to be in my play! Come and get a script. I have an idea." He asked me to do the Whorse Girl (Pony Girl), the whore that was a horse, like Napoleon's stallion. I didn't understand the play at all. The most creative, incredible experience of my life! We choreographed that thing in about 15 minutes. He told me to just work on the stallion. "Have you ever seen them tame a horse?" I told him I was born on a farm, so knew something about it. I said, "You mean, I can prance and whinny and bite?" (She joyously makes all the sounds.) He said, "Yeah, all of that!" He gave me a wonderful entrance down a staircase. I had a kimono on.The guy was there that was my Napoleon. He has me walk around him and disrobe. Out comes this tail. I have to dress him and take him to war, to Chopin's march (she intones music). The audience was on their feet! He told me to work on the horse...and he gave me everything! Now when a director does that...! He knew how to best illuminate it! He had a genius about staging so that you got it! When you teach your students, what do you tell them? 10 years to make an actor, 20 a master. Are you willing to go to work? If you're not, this is the wrong place. There is a craft to learn. If you can't commit to at least 2 years with me, don't commit, 'cause that's how much time it would take for you even to begin to get what I'm talking about. And when I'm dealing with my MFAs at UCLA, I have to tell them to forget everything they've learned. They're acting all over the place and screaming and shouting...all signifying nothing! I have to start from the beginning. And with my work with Lee I realized there are wonderful exercises to bring people home, not because I want them to be themselves, but I want them to be able to connect to being human. And how else, unless you are, unless you can be, human and look first, "What do I know?" And characters are about who, what, when, where and why? Not what they do in life. I have to get all the facts and then I can make character choices. I've got to be able to marry the character. Salome Jens is that committed as an actress! How lucky students are to have her as a teacher! She is so joyously passionate about everything she does. See her in About Anne @ Group rep in NoHo November 19 and 20! Call 818-700-4878! Tix are $25 in advance, $30 at the door. The Lonny Chapman Theatre is @ 10900 Burbank Boulevard in NoHo. 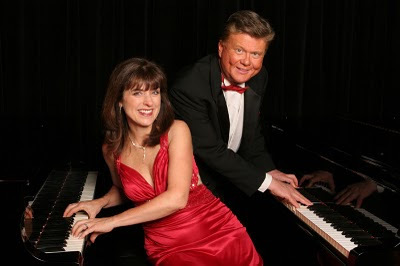 Prolific musician Deborah Johnson has composed the music for an exciting new musical Stiltz! set to open Friday, September 24 at the Actors Forum Theatre in NoHo. On Stiltz!, Johnson also serves as musical director. Her partner Wayland Pickard (in photo above), another virtuoso, is co-directing the musical with Doug Engalla. Tell me about Stiltz! and what makes it unique as a musical. DJ: Stiltz! is a modern take on the Rumpelstiltskin tale set in Office #7 on the first floor with a computer nerd, inventor father and evil boss. It is unique as a musical because many of the songs can stand on their own. One of the biggest comments that I get is that people cannot stop singing the songs. There’s lots of singing and dancing in the show. his version is also unique for another reason. Since it is set against the backdrop of contemporary corporate America, it has a timely message for us all...when you make a deal with the Devil, you have to pay the price! What kind of music may we expect? Is it for kids as well as adults? Or is it geared to adults like Sondheim's Into the Woods? DJ: Paula Miller , who wrote the book, and I researched several fairy tales and found that thankfully Disney would not be producing Rumpelstiltskin in the near future. We defined the main characters and Paula used the outline of the original tale to put together the form of the book. As we worked on each scene, there were themes that developed and I began writing the songs around the characters with some of the song titles that emerged from the themes of each scene. I make up real rough scratch song tracks in my studio, many times singing all the parts just to hear how the song will fit with the dialogue and story. The music is not formulaic in its approach, but uses multiple stylistic elements of rock, pop and even techno. It was very fun to write and I think it’s fun to listen to. Anyone from middle school to adult will enjoy Stiltz! It’s light, easy to understand and very entertaining. Tell me about Double Grande: Legendary Duets and your participation in that. Thank you, Deborah, and I am proud to say that we were recent Grammy Award contenders. We present a variety act of music, comedy and impressions. It's "Sarah Brightman meets Victor Borge". Deborah, what's next for you in the music world? I have a couple of music tours ahead. I’ve got a solo show in Wickenburg, AZ, then Wayland & I have a tour and a series of shows with Double Grandé, which I’m really looking forward to. I’ll also be working hard on getting another one of my musicals Tsarina ready for it’s world premiere at the Grove Theatre in Upland, CA March 2011. Wayland, tell us a little about your successes with Polyester. Polyester-The Musical was just published by Samuel French in New York and just completed a midwest tour. There is talk of adapting it for television sitcom consideration. Congrats and your other musical E-Love was recently published as well, correct? I understand Michele Bernath is doing the choreography for Stiltz!, so it seems you guys are in terrific shape. DJ: I really appreciate the team that has helped to make Stiltz! happen. Just like it takes a village to raise a family, it definitely takes a town to launch a musical. So I’m glad I’m in a good town!